HAPPY WEDNESDAY!! It's time for Cuttlebug Challenge Be Inspired #71 Challenge! And we are ***STITCHING/SEWING*** this week! That's right! GO Dust off those Sewing Machines & get ready to *SEW* because if I did it, you can too! Stamps: Stampabilities, House-Mouse Designs stamp called "Perfect Fit" from 1999, #HMJR1009, featuring Amanda & Maxwell. Sentiment is also by Stampabilities, called "Sew Much", # QR1054. FOR some fabulous Stitching on cards & SEWING TIPS, TRICKS (for both new Beginners like myself & the Advanced Sewing Pros), come check out Cindy's wonderful Tutorial found at the Cuttlebug Challenge UNIVERSITY HERE! ! If you havent checked out out the CUTTLEBUG CHALLENGE BLOGSPOT BLOG YET, then you are seriously missing out on daily Tips, Tricks, Designs, Principles for Crafting, Scrapbooking ideas, Cards Gallore...etc..etc..!! It's such a GREAT place that we already have 3,000 followers and are on a mission to acquiring 5,000 by SUMMER 2010!!! Our main GOAL is to INSPIRE YOU with exciting ideas, challenges, tutorials, videos & fantastic Prizes from well known Mfgs and our main Sponsor Provo Craft!! SO GO CHECK US OUT AND BECOME A FOLLOWER to make sure you dont miss a single day of all this CRAFTING inspiration! Oh way to SWEET, lovin all your details. Oh my....this is over the top! What a fun, whimsical, GORGEOUS card!! I absolutely LOVE all of your details here, it really is amazing....awesome job with this week's MM sketch! America I love your card!!! What a adorable image!!!! Oh my word is this ever soooo amazing!!!! All those sewing details are AWESOME!! What a darling creation and over the top beautiful! Hi America this is one AWESOME creation very clever details the bobbin & all that sewing & thats befor I get to the amazing image & colouring...you put me to shame.. OOMG!!!!! You are just amazing... so talented...this is gorgous...your attention to the details is unbelievable.. WOW!!! America this is just a stunning card, all the details and fabulous colors and coloring. You rock girl !!! I wonder if there is a program for those of us suffering from embellishment envy??? Are you kidding me, thse buttons are so stinkin' adorable!! EEK! This is so cute! 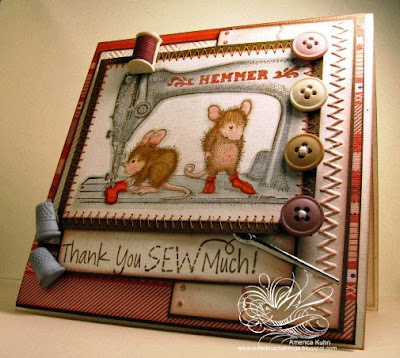 Always love the mice and your sewn embellishments are PERFECT! Your creations never cease to amaze me! This is stunning America. What a sweet image and your coloring and design with the sewing is gorgeous!! What an awesome take on the Midnight Madness sketch!!! I love all your creations GF! You are a card making genius! I love that you have a spool of thread and thimbles to tie in with the sewing machine and you actually sewed part of the sentiment. You rock, America! 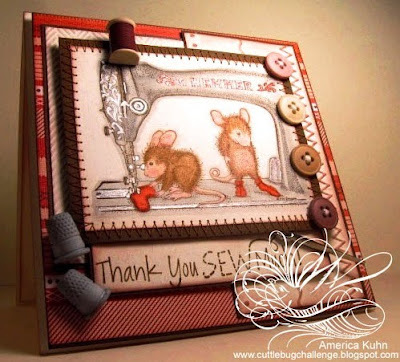 House Mouse Stamps are so darn cute and your two cards show off the images perfectly. What a beautiful card America,i love your image and papers. Yes! Perfect, America! I tried to find those same type of embellishments for my University card and couldn't! I love this card! America-Those embellishments are superb! This card is "sew" beautiful and you "zipped" right through the challenge!!! I won't have to "needle" you or "Pin" you down about participating at MMSC. You can tell me to "cut" this out now...LOL I love to sew-this speaks to my heart and has charmed and enchanted me. Well done!!! Thank you for joining us again this week at the Midnight Madness Sketch Challenge. We love seeing your work and having you as part of our family. You are such a wonderful card artist! You have mastered the sketch and did wonders with this image. Thank you for sharing your talents with us at the MMSC. We love having you join us. Oh America this is fantastic!!! You know... I first found you and your incredible talent on the HM challenge... I love them! I have loved HM since the early 90's when my DD fell in love with them! You have done an amazing job with this image! Love how you used the sketch and your take on sewing!!! Great job! This is adorable, America! I love the sewing theme and I think your sewing looks wonderful. Love the sewing theme embellishments. Wowzers this is cute! Love that CB zig zag. This turned out awesome! So adorable and beautifully done, America! Lovely sewing detailing and touches! Terrific card! Its stunning America. An amazing card with so much detail! America, this is such a stunning creation! I love the house mouse image and all your fabby embellies. Your details really are outstanding! Fantastic job with the sketch this week. Thanks so much for playing along again. Oh my! I can't even believe how cool this is. Brilliant off-the-hook details! So cute... Love everything about it!! !